This is completely unbelievable. Assume that several thousand victims are out all likely7 labelled as victims of autism instead. What is most unbelievable is that the american press is actively hiding the truth by not even looking for the smoking gun and the stack of evidence in the USA. That increase in autism is surely a plausible derivative of flawed vaccines or is it? Again i lack real comparables to make the case. What is true is that the press in Europe is supporting that paradigm and we are ignoring it..
GSK Pandemrix H1N1 Flu Vaccine has damaged hundreds (or thousands) of brains and paid out billions in damages. Yet people still think vaccines are safe? "Across Europe, more than 800 children are so far known to have been made ill by the vaccine," reports the International Business Times. Narcolepsy affects a person's sleeping cycle, leaving them unable to sleep for more than 90 minutes at a time, and causing them to fall unconscious during the day. The condition damages mental function and memory, and can lead to hallucinations and mental illness. "Norway has seen more than 170 reported cases of children developing narcolepsy after receiving the Pandemrix vaccine," reports the Global Post. "The government has so far paid $13 million to 86 victims, including 60 children..."
More than 2 million Norwegians, or 45 percent of the country's population, were given Pandemrix in an unprecedented drive. The vaccine is produced by GlaxoSmithKline (GSK) and was used to inoculate up to 30 million people in 47 other European countries. "The situation is terrible," she says. "He's 100 percent disabled. We don't know if it's going to get better, he's on so much medication. But we hope something will happen, that he will get his life back." Peter Todd, a lawyer who represented many of the claimants, told the Sunday Times: "...The victims of this vaccine have an incurable and lifelong condition and will require extensive medication." In other words, children who are damaged by vaccines generate even more profits for Big Pharma by being damaged! It's the perfect sinister revenue model for an industry run like a criminal mafia. "Among those affected are NHS medical staff, many of whom are now unable to do their jobs because of the symptoms brought on by the vaccine," reports the IBTimes. "They will be suing the government for millions in lost earnings." "If you make him laugh, he collapses. His memory is shot. There is no cure. He says he wishes he hadn't been born. I feel incredibly guilty about letting him have the vaccine," said his mother Caroline Hadfield, 43. If 800 children were brain damaged by the swine flu vaccine in the UK and across Europe, how many children were damaged by the same vaccine -- or other vaccines -- in America? 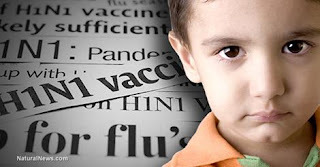 Vaccine Injury Denialism -- a particularly dangerous form of delusional junk science -- is the present-day mantra of the pharma-controlled press, which includes all the usual suspects such as the Washington Post, New York Times, CNN and so on. They simply pretend no children are ever harmed by vaccines... and they hope the U.S. public is stupid enough to believe the lie that "all vaccines are safe." Right now, there are 800 children in the UK whose lives have been destroyed by the swine flu vaccine and who will never lead a normal life again. Every year, tens of thousands more children are diagnosed with autism. The vaccine industry is destroying a generation of children -- committing what Robert Kennedy Jr. correctly compared to a "holocaust" -- while the sellout media covers it up. Shame on all of those sellout editors and professional liars in the mainstream media who cover up the truth about an industry that's maiming and killing our children by the thousands. Do you have no sense of humanity? Across Europe, more than 800 children are so far known to have been made ill by the vaccine. The Pandemrix vaccine was manufactured by pharmaceuticals giant Glaxo Smith Kline, which refused to supply governments unless it was indemnified against any claim for damage caused. The company will pay the bill, and claim the money back from the government. "There's no doubt in my mind whatsoever that Pandemrix increased the occurrence of narcolepsy onset in children in some countries - and probably in most countries," Emmanuelle Mignot, a specialist in sleep disorder at Stanford University in the United States told Reuters. Mignot has been paid by GSK to research the effects of the drug. Among those affected are NHS medical staff, many of whom are now unable to do their jobs because of the symptoms brought on by the vaccine. They will be suing the government for millions in lost earnings. However, the vast majority of patients affected - around 80% - are children. Among them is Josh Hadfield, 8, from Somerset, who is on anti-narcolepsy drugs costing £15,000 a year to help him stay awake during the school day. "Further research is needed to confirm what role the vaccine may have played in the development of narcolepsy in those affected," the company said in a statement.